GeoRunner® Scour Protection Mats | GeoCHEM Inc. When concentrated flows or water fluctuations cause scour, consider the Presto GeoRunner® Scour Protection Mats. 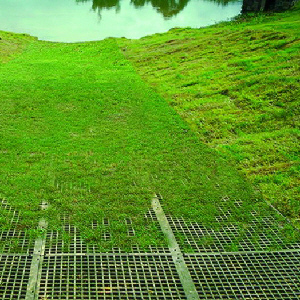 Durable GeoRunner mats protect embankments from erosion caused by surface flow and are ideal for protecting channels, shorelines, culvert outfalls and areas exposed to concentrated flows. Designed with a high open area, the structure fully engages with the vegetative root system, creating dense, stabilizing grass growth. This dense vegetation reduces visibility of the system once vegetation is fully established. GeoRunner® Material: Polymer (See specifications and other design and construction tools on right sidebar). GeoRunner mats are also beneficial for surface protection Click for more information. Submit Project Information Project information will be placed in Presto's Project Library as reference and will be considered for case studies and/or magazine editorials.